As a writer with potential, or would-be writer, or pretend writer with faded corduroys, I remember hearing someone ask me, "Do all writers need a moose?" "I don't think everyone needs a moose," I said. "I assume a lot of Canadians need them, and perhaps nature writers, but, no offense, your question is kinda dumb. ... Hey, wait a second. Are you hitting on me?" After an ensuing debate and argument, I realized the guy was actually talking about a muse. Apparently, that means some type of inspiration, and a lot of times it's a person who is the muse. Well, upon hearing that, my reaction was this: "Ewwww, that's creepy." So I've never been a fan of muses, but I think that's because I never had one - until now. I am inspired by Brobee, the suave star of Noggin's "Yo Gabba Gabba!" 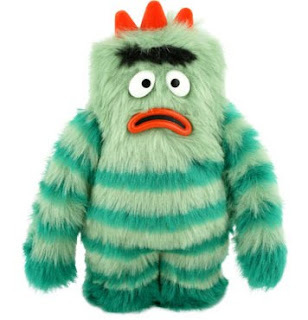 Brobee dances a lot, has parties in his tummy and sometimes gets sad when he is confused. I love this dude, and he's my muse.